I’ve written much over the past couple of weeks about the DWP’s apparent determination to persecute unemployed benefit-claimants by forcing them to undergo activities and tests which are totally unsuitable or even fake. That this trend reflects a deliberate vendetta rather than mere incompetence is something that appears inescapably obvious while at the same time suggesting some kind of ‘conspiracy theory’ that some would dismiss as far-fetched. But I’ve come across evidence that this is exactly how the DWP regards claimants. I’ve been reading some information released by the DWP as part of a response to a Freedom of Information (FOI) Act request in 2011 – just over a year after the coalition government took office. This information includes guidance documents to Jobcentre Plus (JCP) personnel that reveal exactly how the government regards benefit claimants – and the process of cutting off their benefits: as an ‘achievement‘ and a ‘positive outcome‘. Substantial – will have sufficient grounds to raise a new FRF that would have the potential to achieve a sanction. The ‘potential to achieve a sanction’. You only achieve something you’re aiming for – if it’s accidental or negative (in your eyes), you don’t ‘achieve’ it.  “I admit I knowingly gave false information” or “I admit I knowingly failed to declare a change of circumstance” (as applicable). 5. Ask the customer to sign and date the statement immediately after the last word. The CCO must witness and date the statement and score through any unused parts to ensure no additions to the statement can be made once the customer has signed it. Remember, this is just an interview. Nothing has been investigated or proven. But the advisor is told that the claimant must sign one of the two statements because otherwise the money cannot be claimed back. This is already twisted enough, but we’re not done yet. The DWP has a specific description for ending claimants’ benefits. Withdrawn applications – ‘positive’. Circumstances that allow benefits to be ‘reduced or disallowed‘ – ‘positive’. If a benefit can be suspended – great. If the claimant misses enough appointments to allow his/her benefit to be terminated altogether – fantastic, Christmas has come early! In March, the Guardian revealed that JCPs are being set targets for ‘sanctioning’ the benefits of people who will have nothing if their payments are stopped (no wonder Foodbanks are having to provide food to vast, record numbers of people in crisis). The DWP denied that any targets were being set, in spite of clear evidence that they were. But now we have it straight from the horse’s mouth – from the DWP’s own guidance notes to its JCP operatives: sanctions are good, great. Positive. Something to be ‘achieved‘ – something to be aimed for and actively worked toward. 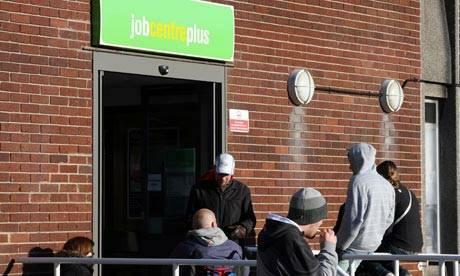 The Guardian today claimed that the unemployed are treated as sub-human under this government. The DWP’s own documents show beyond doubt that this is no mere accident or ‘unintended consequence’. Duncan-Smith’s clearly got mental health issues – why else would he hate people so much?. It’s more and more obvious there’s something deeply wrong with that man. His hatred appears to be manifesting now through clear abuses of his authority, which should be terminated forthwith. This is more evidence the DWP desperately needs clearing out from the top down. Totally agree, BB. However, he’s not, “Duncan-Smith”, that’s just an affectation. Duncan is his middle, given name. He’s merely, “Smith”. A fake double-barrel. How twatular. Ha, definitely adding THAT word to my vocabulary! up and lamposts come to mind. This is an excellent article outlining the most hideous realities perpetrated by this inhumane, murdering government. Thank you for bringing the details to our attention. It was the same in the 1990’s see Peter Lilley’s talking about his little list! Councillor wants children put down if they have disabilities. Where will all end? Is this a positive outcome? My friend has a severely disabled child and she was told his occupational therapy was being withdrawn, because he was too disabled and it would cost too much!! She has to fight very hard for everything her child needs! She is a bright, capable and an assertive person and challenges everything! What happens if you need support from the state, but you or the people you know do not possess these personal qualities? I usually shy away from comparisons with Nazi Germany as they seem histrionic. But sometimes they’re unavoidable. Me too, but this Coalition resemble the Nazis at every turn – you cannot avoid speaking the truth. Great post on SKWAWKBOX that reveals what is written in DWP guidance notes, and how sanctions and the unemployed are treated. My ESA was stopped because of their own error, they sent the benefits award letter to the wrong address and because it was returned they assumed I was no longer living in my flat even though I had another letter stating I had been awarded it which was dated the same day as the returned letter. They will jump on any excuse to sanction even if its their fault. https://www.whatdotheyknow.com/request/customer_compliance_department …….forgive me if I’m wrong but this sounds strange , underhand and contradictory …….they’re saying it’s not a investigation / it’s supposedly part informal but the CCOs ( Customer Compliance Officers ) sound if they’re acting like Fraud Investigators in a Interview under Caution , especially when they’re trying to prove intent by getting people to sign a statement that they knowingly and wilfully failed to disclose etc ………the bingo moment that a pair of investigators work at getting ! However in a IUC you’d have a right to silence , you are not under arrest , you can walk out at any time , the proceedings would be recorded …analogue cassette recorders or CD recorders – digital …….a solicitor can ride shotgun on the interview to hopefully ! to see fair play and can ask for skeleton details disclosure before the interview . I don’t think you’re wrong – I think that’s exactly how it is. yes a Kangaroo court …..some solicitors advise people not to entertain the Revenue , DWP or LAs ( Local Authorities ) …everything has to go through them ..sometimes LAs , the DWP or HMRC back off as they’re arguably trying it on …the kindest thing you can say is that there is ” pressure ” from on high . Also solicitors can mediate / intervene if the case is shock horror , curious and contradictory begging more questions than answers , laid on too thick due to ” New Public Sector ” Management ” ” before anything gets to court . However this option is apparently unavailable – another excuse for a sanction . Grayling wants the American business system , the worst case scenario is ending up on Death Row awaiting the electric chair . If you count the workfare people , the unemployment figures are exactly the same as the early 80’s Thatcher era …JCP+ can’t find people work or enough work to be ” self sufficient ” to quote Lord Fraud …sorry Freud …so the State has turned itself into a sanctioning machine …not very libertarian or it’s liberty Tea Party style . It appears that FOOD BANKS ARE AN INTENTIONAL PART OF WELFARE REFORM. Yes, I’ve heard this before but I don’t believe it’s credible. Trussell Trust are regular and vocal critics of the government’s plans and actions and have met a need created by the government, rather than being created to meet the planned need. To my knowledge, Trussell Trust does not make any profits. They have a set method, but this appears primarily designed to make sure that accusations of ‘free food will draw people who like free food’ can’t stick. People have to be referred to Foodbanks by social services, probation officers, even police – and kind-hearted JCP workers who are brave enough to ignore the DWP’s ban on referring people to foodbanks. The CEO of TT has, as I recall, been extremely critical of the government’s attitude to and statements on foodbank use, so care should be taken drawing conclusions from previous connections, I think. I was put off volunteering (as an atheist) after going to a start-up meeting for the 2nd of two TT foodbanks which opened here – one on either side of the city – just too religious for me. The clue should have been in the fact it was church-run – but still and all. The idea of sitting someone down to chat with them on arrival, having been referred to the food bank, to informally investigate any ‘issues’ they might be deemed to have – before directing them to their food parcel – (chat to be with a volunteer/non-qualified worker, if I understood the set-up) – was too much. I don’t know how common this is at foodbanks more generally. I met (elsewhere) someone who runs a smaller foodbank, simply providing food to people who came in, with very minimal intervention/far less involvement expected/offered. Was contemplating volunteering while not in paid work and I was therefore probably far too close to the ‘expected demographic’ but the ignomy of this process if turning up there as a last resort – just seemed to incorporate additional, unexpected elements – perhaps this is nothing to do with TT but the group it’s advising/helping to set up. (Partly I had contemplated volunteering with the dual purpose of trying to support others in difficulty, while at the same time thinking it might have been possible for me to take some food home after a shift without having to go through an – already – complex/demeaning referral process). This wasn’t a format I felt able to be involved with. If they don’t make any money I hadn’t realised or not properly understood – just saw/heard that they’d expanded (very) fast across the country. It was/is not at all my area of expertise – just seemed very like a business model\franchise. The people setting up the food bank/adjacent cafe were very clear in their intention that, on receiving a package of food, people would then routinely be asked along to a church service where they might receive additional ‘support’, before leaving. I feel that most/many people attending there for help with getting enough food for themselves/their families would not always feel able to refuse but maybe this just goes with the territory. Lots of people seem to be receiving new sign-on times arbitrarily at the moment. I am starting to suspect that there is an intent to set people up to miss appointments! MY jsa so called adviser doesn’t even do job search’s for me, not much help! Housing benefit is suspended until the final decision on a hardship fund, the hardship fund is hard to get, if your single with no kids, there is not much chance of getting it, your left with nothing!, how third world! Your housing benefit won’t be suspended, it’s your JSA that gets stopped. What might happen is that the JC advise the Council that your benefits have stopped and the council then assume you’ve got a job so they stop your HB and CTB. You have to let them know what’s going on. And as for the “benefit scroungers” that we all hear so much about, check out the Joseph Rowntree association’s independent research into the subject. The most amount of social security spent goes on state pension, Incapacity, low income support and housing benefit help, with jsa being a relatively small portion of all money spent. As for those families who have over 8/9 kids, have never worked and have lived on benefits forever, there are roughly 100 of them in the entire country. Granted that’s not ideal but realistically, it’s not that many considering there are approximately 50 million people living in this country… It makes me sad that our media and the government feed us this nonsense about the unemployed and the very few who do take advantag e of the system. The general public believe what they hear which gives our government the perfect excuse to treat all poor people and those in genuine need like rubbish, by claiming to save “hard working tax payers, thousands of pounds” which would go to those who “haven’t done enough to look for work.” Don’t even get me started on the retrospective law that was passed re: the whole workforce fiasco… simply disgraceful…. I received an “Invitation to Interview” out of the blue after being on Invalidity benefit for many years. The appointment was for 3/09/13 and to phone the tel number given. I cant get to this type of apt because of my medical conditions so I phoned the number every 15mins or so for three days only to be informed that the line was busy .,and yes I received a letter yesterday saying that I failed to attend without giving a reason. So you can see where this might lead if I cant get through again. I posted this last year, but in light of yesterday’s post a reminder of how the DWP really regards benefit claimants is timely – and that taking away what is often a claimant’s only support is considered ‘a positive outcome’. This is the malignant influence of the government this country desperate needs to get rid of in May.